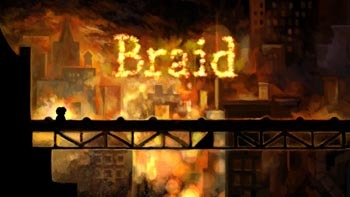 Braid is a time-bending video game by Jonathan Blow, for which I’ve created the graphics. This ongoing series of articles aims to explain some of my thoughts and processes for those interested. For a one-page overview, visit the Braid page in my portfolio. Also check out Jonathan’s blog, where he posts about Braid and other topics related to experimental/artistic/indie games. Some of the first work I did on Braid were these abstract experiments in color and mood. One primitive screen shot receives multiple divergent treatments. How we settled on the look for the first world, and started to produce useable assets. Behind-the-scenes of how my illustrations are assembled into worlds. Art is not just visual; it is emotional. Numerous considerations influenced the design of this key location. This unique area was built primarily from particles. David Hellman you are a genius! Thank you for such a beautiful game. Of every videogame I have played this year, Braid is by far my favorite. Can’t wait to see what you do in the future. Amazing looking style, as was said in the video review this is an important game and kudos for you on making it. Funny I was actually searching for ‘managing risk in game development’ and found this site via some of your old articles you have written.. Glad I did as I have sent all of my artists here to show them what true innovation and courage with a brush looks like.. I do have some plans, although I’ve been side-tracked. The next thing would be to talk about some of the functional objects like gates and switches. There is also a discarded version of world 3 that few have seen (a nighttime forest). And I wanted to write about the characters, and show how Edmund McMillen’s designs have a strong influence on the finished game. Hopefully I will get to some of that! Cool game! All of us must play! I fell in love with the artwork from Braid. So many emotions on so many levels. Do you sell any Braid artwork? I’d love to get my hands on the opening scene with the burning city! Wow, a truly fascinating look at one of the most notable indie games of the past generation! I must say this has given me a new appreciation for the subtleties of Braid both in artwork and execution. The only thing I am left very curious about is the unwritten character animation/art article, that is, if this would ever be finished (Not terribly likely, I suppose, as it was written four years ago, and I wouldn’t ask you to finish it just for me!) Either way, this was an highly interesting read, and looking at your blog, overall your art is very beautiful, so thank you!